Welcome to Tajimaya. This Minshuku is located in Magome along the Nakasendo road which was used extensively by travelers during the Edo Period. All the rooms at Tajimaya are Japanese-style, and all bathing and toilet facilities are shared among the guests. The Japanese "irori" (hearth) is over 100 years old and it is still in use. The owners of Tajimaya serve fresh, local cuisine in the ryokan's dining area and guests can relax in the wooden tubs after a long day's hike. We stayed just one night but really loved it in Magome. Obviously there are significant differences in culture so some things were unexpected but nothing was bad or upsetting. Tajimaya is a lovely Ryokan (although we did not stay at another to make comparisons). The food was amazing and the facilities very good. We did have a little hiccup with the booking which was for two rooms and two people per room. Initially we were given one room with four beds but that was fixed quickly and without fuss. We stayed in this ryokan for one night before going on the trail to Tsumago. Out of the three ryokans we visited during our stay in Japan, this was the best with the lowest rate. Conveniently located in the centre of Magome, very tidy with comfortable futons. The meals are excellent, staff is very friendly. We really enjoyed our two night stay at the traditional ryokan of Tijimaya in the village of Magome. Having been surprised at the number of daytrippers in the village on the Sunday we arrived, it was lovely to retire to our double room in the inn after a delicious Japanese dinner served to guests. Our rooms were spacious and very comfortable, and, as it happened, close to the female bathrooms, although the third member of our party had to head downstairs to the male bathrooms. We had fun the second night learning a traditional song and dance and appreciated the personal contact with one of our hosts, although most of the other staff members were kept too busy to have chats with. 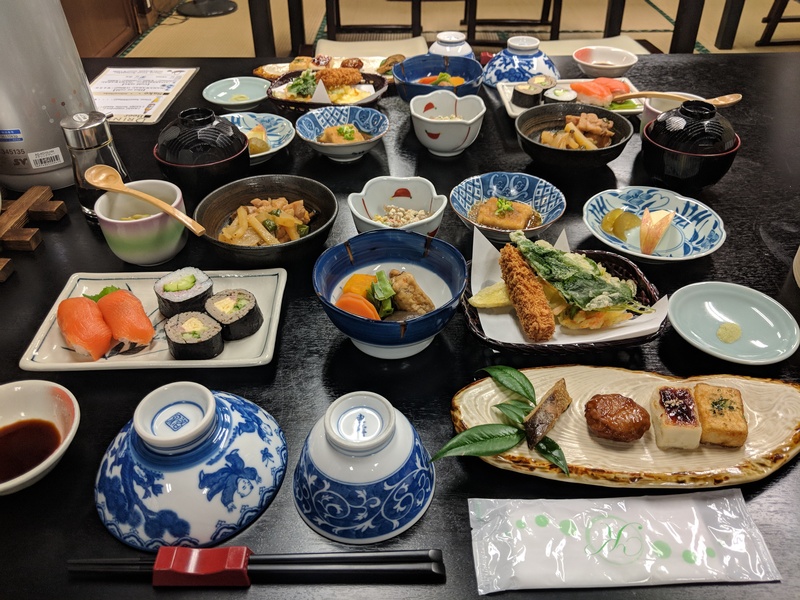 It was the perfect base for us doing the short Magome-Tsumago walk and I'm glad we were able to stay the night before and the night of the walk, so we could relax and enjoy something of a traditional ryokan experience and meals. We enjoyed the chance to experience staying in a traditional Japanese guesthouse. The staff were welcoming and the food was great, lots of different dishes to try. The bathrooms, although shared, were luxurious and welcome after a long day. Excellently located for a stay of hiking to/from Tsumago. 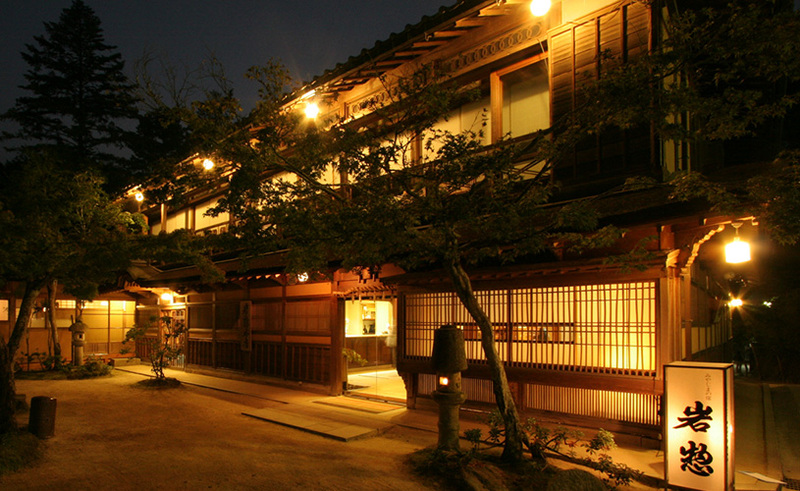 The Tajimaya inn was a wonderful, clean and traditional place to stay with beautiful food served with care. Would highly recommend the place. The bathrooms were clean and a bit of a walk away but having one room to sleep in the other room to rest and drink tea in was wonderful. We loved it there. Tajimaya us a most beautiful ryokan. The village is magical, the view is astonishing. Excellent food, a most exciting stay. My daughter and I stayed here for one night before our summer hike to Tsumago. The Ryokan itself is charming. Our room has two sections divided by two sliding doors. One side is living/sitting room, the other our sleeping area. Quite spacious for Japanese standard. Shared bathroom is right next to our room so not too much trouble. We also enjoy the hot bath: so soothing after a long day traveling. The background of the Ryokan is even more amazing. After dark only traditional low voltage lights are lit along the cobble road. It really looks like we were back to a century ago when the post town was built. Dinner and breakfast was one of the best meals we had in Japan. Artistically arranged, delicious and fresh. With two meals included, I think it is a good value of renting here. I highly recommend staying here! We very much enjoyed our stay. Having a private bathroom significantly added to our comfort. The shared, gendered bathing area was well lit and clean. Both dinner and breakfast were ample and excellent. The highlight of the evening was a folk song and dance that our host instructed all the guests in. While not becoming very proficient we did have a blast, especially when taking our dance out into the quiet cobble stoned main street of the village. All together our stay was a perfect introduction into the Kiso Valley prior to setting out on our hike to Tsumago. Excellent stay. The highlight are the hosts, who sang, taught us a little dance, and told us about the house/home background. Bath was good, toilets, washrooms multiple. We were nextdoor to toilets so handy, but it could be a walk if room located further away. Stayed at Tajimaya one night only. Staff were efficient and our little contact with them was cordial. They were busy, as the Inn was quite full, and we arrived later in the day and left very early to hike to Tsumago so there was no time to socialize. But the Inn was very clean and our room had a private toilet which was convenient. I enjoyed our stay and would love to visit again and perhaps stay longer. Loved that part of Japan and enjoyed our hike to Tsumago. We walked from Tsumago to Magome with our two kids (8 and 10yo) in the snow. It was a perfect day, and topped off by finding a comfortable and quite place to stay in the picturesque Magome. After a traditional bath we dressed in the Yukatas that were provided and sat down for one of the most memorable feasts of our trip in Japan. Truly spectacular and highly recommended. We had a 5 ***** stay her with the Wong family from Singapore and another couple. After dinner our host taught us a traditional song and was very patient while we learnt a traditional dance too. We then enjoyed some Seven Smiles Sake followed by a cup of tea. A wonderful warm welcome and friendly farewell in the morning. This ryokan was amazing! The host really went above and beyond for this one. After having a fantastic gazillion-course meal (of which, the host had also harvested the rice himself! ), he taught us a traditional Japanese song and dance. The room itself was great, and the town was so picturesque - the snow covered everything. I would definitely stay here again if I go back to Magome. We stayed at Tajimaya for two nights in mid-April. We had a wonderful stay -- in large part due to the kindness of the owners. Our children are somewhat picky in what they eat, and the first night did not eat much of what was served to them at dinner (despite the fact that there was a considerable diversity of foods served). So the next morning, the owner came up to us and asked what our kids liked to eat. The following evening, they had tailored our meals to fit our kids' tastes. I've stayed at multiple minshukus and ryokans in the past, and never had such individualized service before. Besides that, we enjoyed the dance and song lesson, the location right in the busiest section of Magome, the comfortable room. We would recommend Tajimaya very highly. We walked from Tsumago on a glorious, warm Autumn day and were very happy with the comfort and cleanliness of Tajimaya. 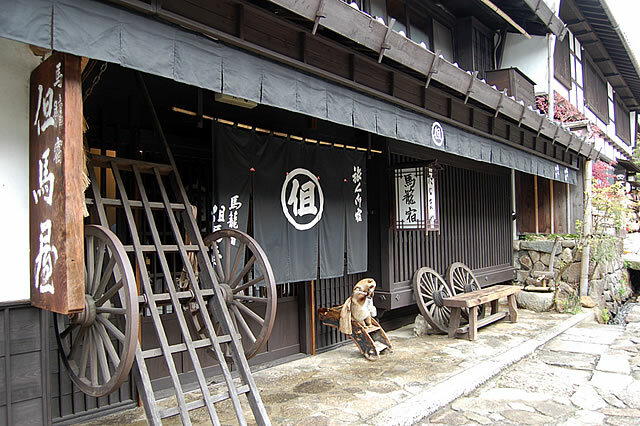 The inn is centrally located in the village and the benefit was we could enjoy Magome in the early morning and evening without the crowds of sightseeing groups who visit. The staff were very efficient and helpful about dropping bags off and providing information. We had a sleeping room and a living room at the back of the inn, which was very quiet. The facilities are shared and but they were very clean. Dinner and breakfast were excellent! Of the three ryokans I stayed in through Japanese Guest Houses, this was my least favorite, probably because it was fully booked & the staff were pressed to cope. My room was very quiet, but the couple I sat next to at dinner (assigned seats - not my favorite) had a room next to the bathrooms. I stayed for a day here in November and enjoyed myself. The Tajimaya inn retains an old-world atmosphere with its decor, and I found it to be clean and comfortable. The hosts were all friendly, and I remember one (was he the head of the inn?) who chatted with me and told me he farmed the rice we were having. And of course, the rice, along with the rest of the food, was delicious - exceptionally so. Like many traditional ryokans, the toilets and bathing facilities are away from the rooms, and Tajimaya is a little more troublesome than most; I stayed on the second floor and had to go down to the basement to use the gents. I'd still highly recommend the inn if you don't mind this inconvenience.